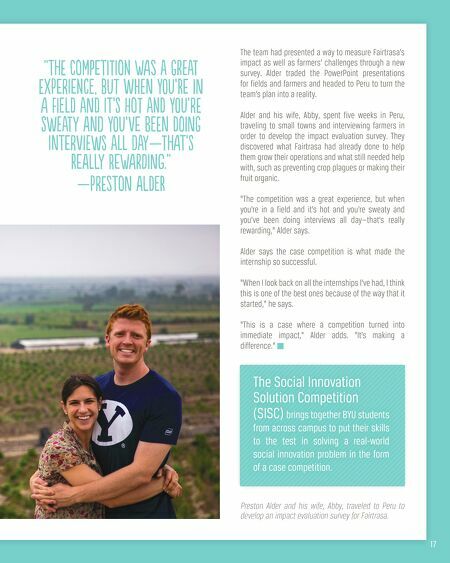 The Social Innovation Solution Competition (SISC) brings together BYU students from across campus to put their skills to the test in solving a real-world social innovation problem in the form of a case competition. "the Competition was a great exPerience, but when you're in a field and it's hot and you're sweaty and you've been doing interviews all day—that's really rewarding." —Preston alder 17 The team had presented a way to measure Fairtrasa's impact as well as farmers' challenges through a new survey. 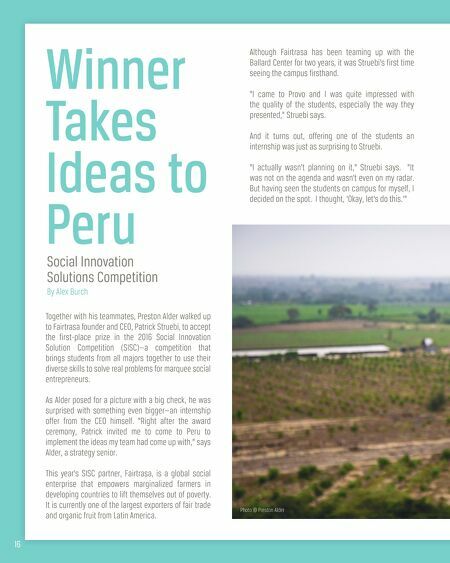 Alder traded the PowerPoint presentations for fields and farmers and headed to Peru to turn the team's plan into a reality. Alder and his wife, Abby, spent five weeks in Peru, traveling to small towns and interviewing farmers in order to develop the impact evaluation survey. They discovered what Fairtrasa had already done to help them grow their operations and what still needed help with, such as preventing crop plagues or making their fruit organic. "The competition was a great experience, but when you're in a field and it's hot and you're sweaty and you've been doing interviews all day—that's really rewarding," Alder says. Alder says the case competition is what made the internship so successful. "When I look back on all the internships I've had, I think this is one of the best ones because of the way that it started," he says. "This is a case where a competition turned into immediate impact," Alder adds. "It's making a difference." Preston Alder and his wife, Abby, traveled to Peru to develop an impact evaluation survey for Fairtrasa.